I recently purchased a print off of eBay taken from the 1st American edition of the Encyclopedia Britannica, printed in 1797. Having been brushing up on my natural history over the last year, the title of this print immediately caught my attention and therefore I had to purchase it, especially considering how inexpensive and in what good condition it was. The print was titled, “ANIMAL FLOWERS” (below). I vaguely remembered from my readings that, although Carl Linnaeus had attempted to delineate a neat, separable category for every living thing on earth, some creatures were stubbornly determined not to fit into any single kingdom but instead straddled the line between, for instance, plants and animals. 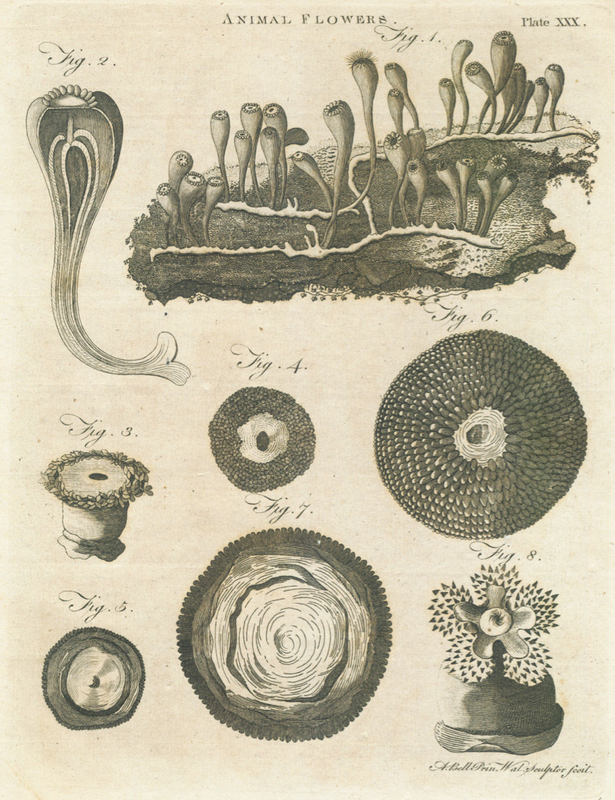 While the literature is heavy in old discussions of the cnidarian hydra, otherwise known as the “polyp”, a type of sea anemone that, though motile, remains permanently in a polyp stage, the sessile adult-like medusa forms of sea anemone also posed Linnaeus and his comrades some problems. 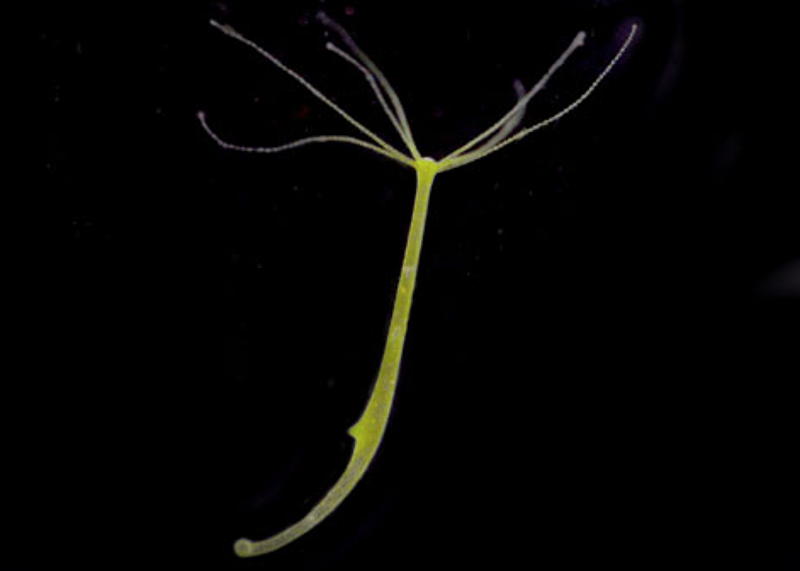 A hydra which, developmentally, remains in its motile, polyp form. Otherwise known as “animal flowers”, these sea anemones baffled the Victorians with a combination of flower-like and animal-like characteristics. While their general appearance suggests that of a plant, their capacity for movement is decidedly animal-like in fashion. After all, plants can of course move, but with the exception of a few carnivorous examples, plants move via growth, e.g., towards a light source, which is not immediately observable. Meanwhile, the “polyps” and “animal flowers” are capable of immediate and observable movements in reaction to some stimulus. In short, they have primitive forms of striated muscle, which allow rapid contraction . In addition, their incredible capacity for regeneration of injured “limbs” baffled natural philosophers far and wide and was the subject of extensive study, especially by Abraham Trembley. Various sea anemones. Print by Giacomo Merculiano (1892). Nowadays we know that sea anemones are metazoans or, in other words, “animals,” albeit of a primitive nature compared to ourselves. They’re not quite as primitive as sponges, however, as they have an identifiable nervous system, simplistic though it may be . As you might imagine, the developments of the nervous and muscular systems are tightly linked: if you wish to move around your environment rapidly and with purpose, you must have nerve cells that communicate to muscle cells when and how much to contract in order to carry out those movements. Anyways, a little history about the original print itself. It was a plate from the 1797 American version of Encyclopedia Britannica which, sadly, has been butchered for the individual sale of its prints. From what I surmise, it was closely based off of an earlier illustration published in the Philosophic Transactions of the Royal Society of London in 1767 in an article reporting on the discovery of the “clustered” or “social” animal flower, aka Actinia sociata  (image below). You can see the two illustrations are very similar, though not identical. Over time, I will continue to try to research the roots of this print and the related history of the fascinating Animal Flowers. 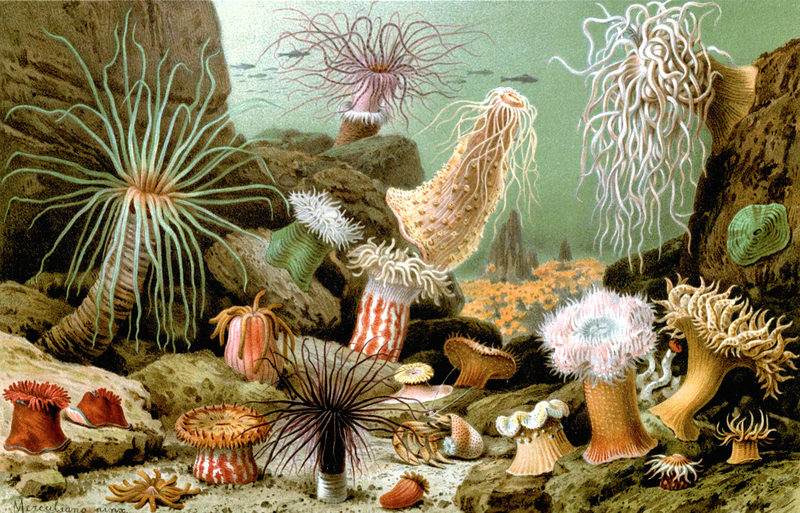 Interestingly, although we no longer refer to sea anemones by this archaic term, the class name “anthozoa” means exactly that, flower-animal. Unsurprisingly, this is a class name that it’s flower-like reef-building coral cousins also share. Though these socialite sea anemones were discovered around the Caribbean, just this last month a new species of Antarctic anemone was discovered . 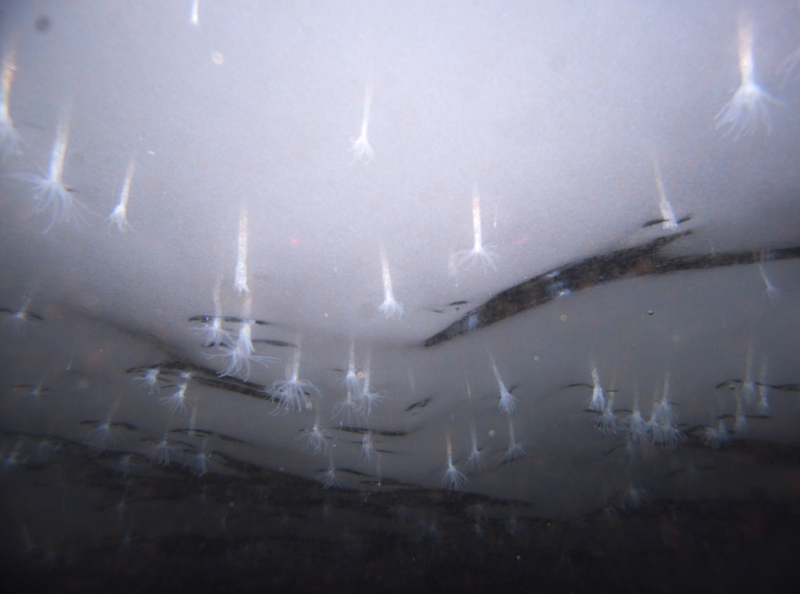 Although there have been other species of anemone found to make their homes in those frigid waters, this is the first anemone known to live in ice, spending their lives hanging upsidedown, in contrast to all other known sea anemones which reside on or near the sea floor. 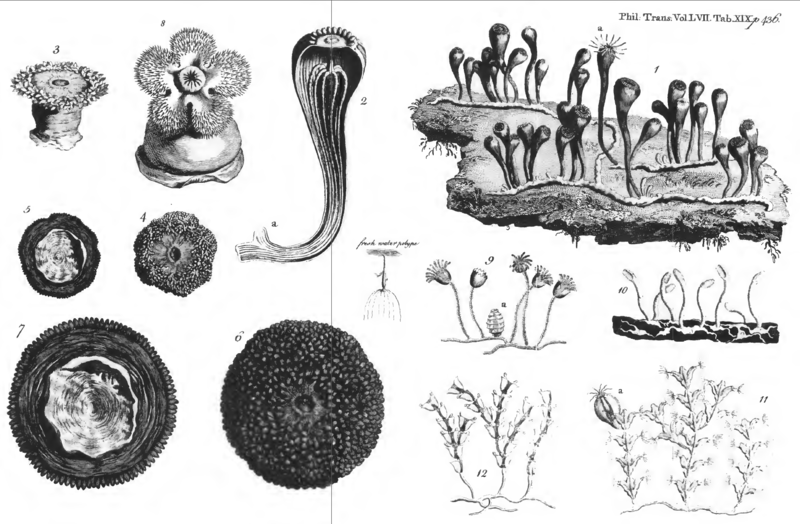 As old as my newfound print is, as long as scientists have been studying and debating about the “animal flowers”, it seems even now we’re still discovering new things about these fascinating and foundational metazoans. Is it any wonder so many Biology 101 students study the hydra under simple light microscopes as an introduction to the wonderful world of Life Science?